Meet Sweet Pea, the adorable orphan lamb, and discover why her true story has enchanted readers of all ages and become an instant New York Times bestseller. Now a board book! One cold winter night, Sweet Pea becomes very sick. Everyone at the farm is worried about her! Under the watchful care of Farmer John, Laddie the sheepdog, and Dr. Alison the veterinarian, she slowly recovers. 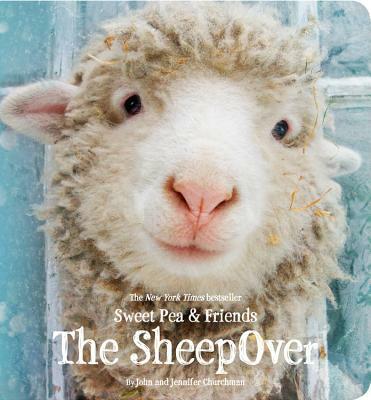 When Sweet Pea is better again, she's ready for a fun and imaginative "SheepOver" celebration! This charming story of caring and friendship by farm owners John and Jennifer Churchman--creators of The Sheepover, Brave Little Finn, A Farm for Maisie, Alpaca Lunch, and The Easter Surprise--is brought to life with entrancing photo-illustrations and will enchant readers and make them fall in love with Sweet Pea and her friends. "I'd never met John, or heard of his farm, but when he brought in this book for us to consider selling, it was hard not to jump over the counter and pump his hand in congratulations....This is a book that sells itself the minute you put it into a customer's hands."